Hoping for some understanding dog lovers out there to help me out! You might want to start with giving a good bath with a good dog shampoo and a good dog conditioner. Or you could start with a spray in leave on conditioner for dogs and really work it in and try to comb out some of the matts. If you are actually able to bath your Chowling, then that would be a good start...but you probably won't get all those mats out. You should invest in a Mars Coat King rake -there is the furminator that might work, too. I don't have experience with it but others have. You might try to use the search option to find posts regarding the furminator. You should also get a pin brush...then brush and brush and brush! Is an excellant new product for dematting. recessed, curved blades effectively cut and separate the matt, allowing the groomer to brush the matt out with less hair loss and less trauma to the dog. Rubberized handle allows better grip. As this is a razor blade product, care must be taken when working with the coat- cannot be used to remove matts that are tight to the skin. Not to be used as a coat thinning tool. if chow is really badly matted just clip them all away with a set of clippers ... the hair *should* grow back .. Unfortunately, sometimes it doesn't take long for the the coats to mat...some days, I think Tess can get knots behind her ears in a day or two. I don't know how well you girl tolerates you grooming her, but my family ran into this a few years ago. We gave her a bath and used a really thick, moisturizing conditioner on her. Once she dried, we ended up having to use the clippers on her. We left about 2-3 inches of fur, enough that she still have a nice thick coat, but it cut through a large part of the mats. After that, what still had mats was short enough that it brushed out pretty easily. Most of the mats Tess had were hair that came out (it was spring, so the winter coat was loose), the loose hair tangles, then matted in the rest of her fur. The two thing I would caution about using the clippers is it's fall (or close to it), clipping off too much is going to give you a cold chow this winter because it may not have time to grow back in completely before it gets cold, and second, shaving down to the skin can damage the hair follicles, making it a very, very long time before the hair grows back in, in rare case, maybe never growing back in. I have a mat cutter that I got because of both long, double coated dogs my family has. I have had no success with it, it just seems to pull their hair instead of cutting through it. I have before used a small pair of scissors to cut into a the center of mats to break them into smaller, more manageable pieces. Unfortunately, my collie needs four people to use the scissors on her...3 to hold her down, 1 to cut because she hates being groomed and I don't want to take the chance of her getting cut. If you do want to avoid clipping, especially with the time of the year, if your chow will let you, just maybe work on one section a day. I like the rakes, when Tess is shedding badly, I will break our sessions into four or five days, one day for each hip/back leg, a day for her mane, a day on left side, right side, then when I can get someone to help, her chest (she wiggles too much when I try to do her chest for some reason). Working on smaller sections a day at a time gives both of us more patience. Whatever you choose, good luck with the mats. I found a huge dread lock on Hannah last night and had to take the scissors and cut it out. No way it was going to comb out. I had gone to a professional salon supply (Sally probably) and got a really good pair of scissors so the are small and easy to get under the mats and cut through, and VERY sharp. When Marshall had these on his back legs and I didn't want to give him an afflicted looking haircut I would use a regular comb and pull at then gently. This would last only as long as his patience for it, so sometimes ya gotta just cut them out. Mr. N's groomer says it's safer to remove the really tight mats close to the skin with the clippers (shaving thing). When Mr. N is patient (sleepy), I will use my finger nails to "feather" out (pull apart) the mat. It takes a while and maybe a couple of sittings but I have removed some of his mats that way. Being a groomer myself, I have seen some of the results of home grooming. I would seriously recommend taking him/her (I forgot, and can't read what you wrote while I'm typing this reply) to a professional groomer. If you talk to the groomer and voice your concerns, they will work with you. You could see about doing a little bit at a time or doing what I call an express service. This is where the dog is done straight thru and not kenneled. I am not sure how other salons work, as I am only familiar with PetSmart. If you have one in your area, that is the best place to go(not being biased or anything ). They have have the highest safety standards and there are windows in the non-bathing area. You could also ask for someone who is not nervous around chows. Once you get all the matts/undercoat out, it is much easier to keep up on it. 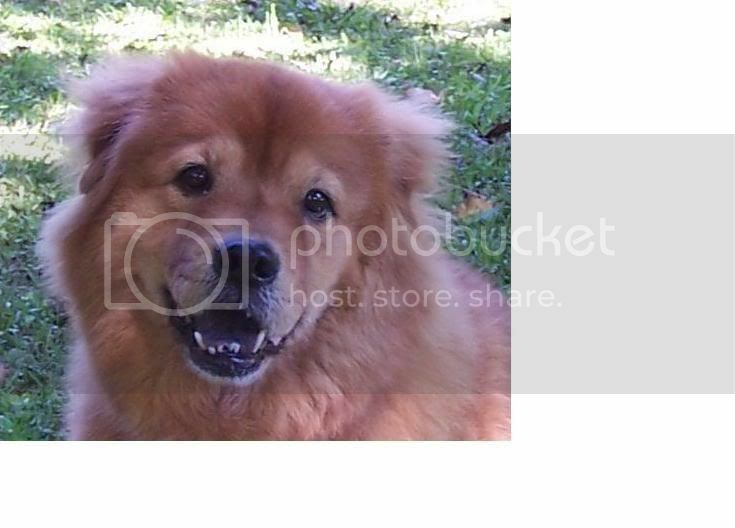 Also, I never recommend shaving a chow/chow mix, (except matts) You can shock the coat and it won't grow back right! It may not happen the first time, but you increase the risk every time you do it and the older your dog is. Even an in between length can shock the coat. PM me if you have any other questions.... just trying to help! summer_rose03 wrote: Being a groomer myself, I have seen some of the results of home grooming. I would seriously recommend taking him/her (I forgot, and can't read what you wrote while I'm typing this reply) to a professional groomer. If you talk to the groomer and voice your concerns, they will work with you. You could see about doing a little bit at a time or doing what I call an express service. This is where the dog is done straight thru and not kenneled. I am not sure how other salons work, as I am only familiar with PetSmart. If you have one in your area, that is the best place to go(not being biased or anything ). They have have the highest safety standards and there are windows in the non-bathing area. You could also ask for someone who is not nervous around chows. Once you get all the matts/undercoat out, it is much easier to keep up on it. Tell me about it. The boy I rescued back from his neglectful owner had shaved him, meaning down to the skin, 3 yes THREE times! and he was only 1 year old. Flippin ticked me off. I do have a HUGE suggession for helping to bring the coat back to life. You all carry lipidern at petsmart so that is the obvious recommendation for you all, but I personally use smart bites skin and coat treats from Walmart. (Ol Roy, the ONLY thing Ol Roy I use! and if Purina made them then I'd buy their version) Using an excellent dog food like Purina One Lamb and Rice, or naturals lamb and rice or chicken and barley helps too. Caesars coat is nearly back from a very dead/dormant state. He has just 2 patches on his back left to go. He is 60 lbs and we make sure he gets 3 treats a day. Working wonders, anyways, lipiderm is a liquid that can be measured and poured onto thier food and has pretty much the same results. Its great to give all chows / double coated dog breeds as it helps have a very luxurious coat that is EASY to maintain. It looks like a T and has 2 rows of teeth and it brushes and removes undercoat all in one very easy gentle step. It acts as a stripper but without all the damage. Just brush brush brush and that undercoat that causes the matts is taken away like magic. Here is one like I have, mine is a different make but same pins http://www.carealotpets.com/item-detail ... bigPicture It is B the 39 tooth double row. As a hairdresser (Master stylist of 16 years) I would actually have recommended you use a pair of thining shears on the dread lock, first at the top, combing from ends to root. once you got it free a little ways, use the thining shears a 1/4 inch down from where you were, then comb again, ends to root and then snip 1/4 in down. If matts are really bad you can use the thinning shears to give a natural look and not make it look like a huge clump was removed like with straight sharp scissors designed for precision cuts. What say you Ms Dog Groomer? good advice? My Ping is the same way (minus the mats). She loves me, but is extremely fearful of anyone else. She comes around when I have company, but won't let anyone near her. She huffs and woofs at them. This is why I hate taking her to the groomers. The last time I took her (Dec 06), she and Bear went together so it was less stressful for her. But as I was loading her back in the vehicle, she slipped out of the harness and took off!! Needless to say, I haven't gone that route since. Samantha, my oldest, doesn't stress about anything but I hate to put her through anything like a grooming session that lasts for hours. Right before her recent surgery I went to one of those self-washing places in a local doggie daycare. It wasn't as fancy as the website made it out to be, but it worked. It cost me $15 and I was able to use their shampoo (they had many choices) and wash her as long as it took to get her scrubbed up. Sammy had come to me with big mats on her hindend. She hates to be groomed back there. The best part of the self-service wash was the blow dryer. It was one of those industrial dog blow dryers. It practically blew the loose fur off of her and she was almost dry in no time. Maybe you could find one of those places near you and tell them your issues. They're usually pretty empty during the weekday hours and would probably let you spend more time then. The other option is to lock both of you in the bathroom and spend lots of quality time together. Once she's clean, you can start working out the mats and cutting out what you must. I work on each of mine at least every other day so it doesn't seem so overwhelming. Good luck! RHENEGADE CHOWS wrote: Tell me about it. The boy I rescued back from his neglectful owner had shaved him, meaning down to the skin, 3 yes THREE times! and he was only 1 year old. Flippin ticked me off. I do have a HUGE suggession for helping to bring the coat back to life. You all carry lipidern at petsmart so that is the obvious recommendation for you all, but I personally use smart bites skin and coat treats from Walmart. (Ol Roy, the ONLY thing Ol Roy I use! and if Purina made them then I'd buy their version) Using an excellent dog food like Purina One Lamb and Rice, or naturals lamb and rice or chicken and barley helps too. Caesars coat is nearly back from a very dead/dormant state. He has just 2 patches on his back left to go. He is 60 lbs and we make sure he gets 3 treats a day. Working wonders, anyways, lipiderm is a liquid that can be measured and poured onto thier food and has pretty much the same results. Mostly good advice! I don't recommend Ol'Roy or Purina, though. My dog is on Prescription Science Diet R/D (he is over weight), my cats are all on Iams. I wouldn't feed them anything else. The brands I do recommend are Iams, Science Diet, Eukanuba, Nutro/Natural Choice. Authority (PetSmart brand) is also a good brand. Most other brands have a lot of fillers and by-products. My dog is on fish oil pills a few times a day for skin/coat and they work wonders. I just buy the bottles at like Wal-Mart or Target, same stuff, just cheaper! Its approved by my vet. Dog omega 3 supplements are more expensive because they are "for dogs". RHENEGADE CHOWS wrote: ....I personally use smart bites skin and coat treats from Walmart. (Ol Roy, the ONLY thing Ol Roy I use! and if Purina made them then I'd buy their version) Using an excellent dog food like Purina One Lamb and Rice, or naturals lamb and rice or chicken and barley helps too. Mostly good advice! I don't recommend Ol'Roy or Purina, though. My dog is on Prescription Science Diet R/D (he is over weight), my cats are all on Iams. I wouldn't feed them anything else. The brands I do recommend are Iams, Science Diet, Eukanuba, Nutro/Natural Choice. Authority (PetSmart brand) is also a good brand. I didnt recommend Ol Roy dog food now did I? I said the skin and coat "treats." As for Purina One Lamb and Rice and Purina One Natural Blends + vitamins and minerals, Lamb and Barley or Chicken and Rice "having fillers." To quote the label, "No added fillers, articial colors or flavors." It is a very good food for them. Thier muscle tone, healthy coat, eyes and teeth reflect that. Oh Layla, I have missed you. Love the banners... How is Alf doing? I want to say Alfie... do you call him Alfie? [quote="Layla[/quote]Awww! Adorable. kiss him on his sweet little nose for me! Dang, don't you guys know that food fights are for the Food & Nutrition section? If you want to groom you Chow at home, you are gonna need to invest in some equipment. I recommend a grooming table so you don't break your back, preferably with a bar to attach a lead to restrain the dog, unless it will mind without one. Then you need some shears, and a #10 or #15 blade for doing the feet, and a #5 or #7 to cut the matts out and trim here and there. You need a long tooth brush and a slicker brush wouldn't too. You also need a medium or large comb with a combo of medium and course teeth. I suggest getting the matts out before the bath. BioGroom is pretty good shampoo, if the dog tends to have allergies you might want to get some for sensitive skin. It's important that you get the dog dry after the bath, a force dryer will blow the water out and has low heat so you don't dry out the coat and skin. You can get all of those supplies at http://www.petedge.com and they usually have good prices. Get ready to do a bunch of combing and brushing, and usually if the dog has not had a bath in a while the coat will be coming out for a couple of weeks after the bath. Red Dragon wrote: Dang, don't you guys know that food fights are for the Food & Nutrition section? Just thought I would throw this in here.. I had a woman come in a few weeks ago with a 13 yr old American Eskimo that had NEVER been to a groomer. She was thinking about doing her at home because of this reason. I told her I was not against trying and she was telling me that the dog was crazy and would probably crap all over the place. She wasn't sure if I would even be able to touch her. She set up an appt for a few days later. She came in, I went slow with the dog and offered her a treat, although she didn't take it, she sniffed it and let me pet her. Her mom put her on the table and we put the e-collar on her just in case. She let me trim her nails and start getting the hair off with her mom standing there. Her mom left while I bathed her and was going to come back when I was done drying her. She ended up not coming back in and just watched from the window. The acted NOTHING like her mom thought and she was extremely surprised. The dog never growled, snarled, or snapped. She was actually very good for never being groomed. This is proof that not all dogs act the way you expect them too. Oh, and she will now start bringing her in regularly!